Your choice of contractor has the potential to make or break your project. Make sure you choose an experienced contractor like Cabinet Magic for your Kitchen remodeling in Pasadena CA. At Cabinet Magic, we have over 30 years of experience in cabinet fabrication and remodeling. We know exactly how to get you the high quality products you need and manage all the moving pieces of the project so that the work gets done on time, on budget, and with superior quality craftsmanship. 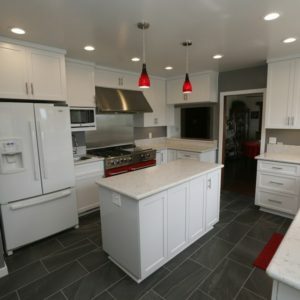 Kitchen remodeling in Pasadena CA can range from simply updating the room with new cabinets, fixtures, and accessories to totally redesigning the floor plan. In either case, you may be concerned about how the finished project will turn out. After all, samples can look quite different in your hand than installed in your kitchen. At Cabinet Magic, we believe being able to accurately visualize your kitchen remodeling in Pasadena CA before work begins is key to being satisfied with the final result. That’s why we always bring proposed kitchen designs to life using 3D rendering software. We’re happy to create multiple versions of the design so you can easily compare different options. We never begin work without your sign off and approval of every detail of the design. The centerpiece of any kitchen design is the cabinetry. With Cabinet Magic as your remodeling contractor, it’s easy to get the exact look and functionality you want from your cabinets, because we have an entire factory dedicated to custom cabinet making. We employ talented craftsmen capable of working in any style to suit your interior design scheme. We offer a variety of different woods as well as a complete palette of designer colors. All of our cabinets are built to a high quality standard incorporating high end features like soft-close hidden hinges and smooth drawer slides. Would you like more information about working with Cabinet Magic on your kitchen remodeling in Pasadena CA? Call us at 800-828-4380 or contact us online to schedule a free in home consultation. We’ll be happy to share ideas and provide a free estimate for the project.